It’s Formal Recruitment Week at Albright! As much as I dread this week each year, I also love it. Nothing makes me happier than to see everybody jumping around on Bid Day and making memories that will last a lifetime. Recently I’ve had a bit more involvement with my sorority sisters – I’m going to be seeing some in a few weeks for Formal AND I was assigned a new member pen pal!! To continue my “everything sorority” obsession, I just finished the book “Sorority Sisters” by Claudia Welch and LOVE LOVE LOVED IT. It reminded me not only of my friends that I made through my sorority, but my friends that I made from the music department and still keep in touch with to this day. I seriously wanted to call every single person once I finished that book. Since I don’t exactly have the time to write an entirely new post, I’ve taken bits and pieces from a post I wrote for another site back in the day! Enjoy! It’s no secret that I was in a sorority during my time at Rochester Institute of Technology (RIT). Unlike some of the people I joined with, I haven’t “outgrown” it. I still try to get back for larger events and while I don’t keep in touch with everybody, I do my best to keep in touch with those I was closest with. One of my friends from Junior League said that she goes on a trip with her entire pledge class every year. Eighteen women. Ten years. That’s kind of awesome. 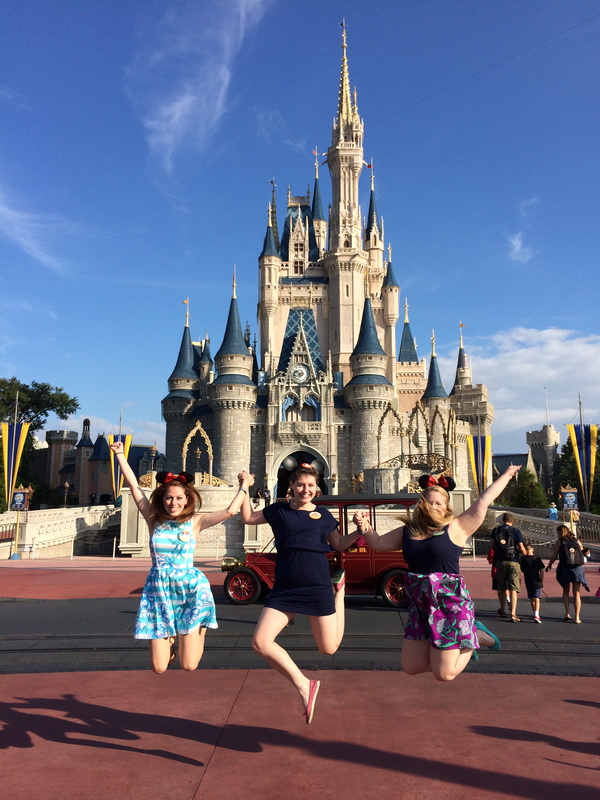 Me, my big, and my little in Disney World. We’re trying to make an annual trip a thing. People frequently asked why I joined a sorority. Now, I’ll be the first to admit that it was never my intention to join a sorority. In fact, I spent most of my first year hating the sororities at RIT because one put a bad taste in my mouth. I’ve found that my answer to that question has changed over the past few years, probably because my feelings towards my sorority have changed. I’m not saying there was ever a point where I didn’t like it, not at all! It’s just that being active is very different that being an alum. (Some of) my wonderful boys! The closest thing I had to a sorority…before joining and sorority. I think I first joined because I really didn’t have any female friends. I am still super close with the guys I spent most of undergrad with (we have yearly vacations!) but let me tell you, things get awkward FAST when you’re on a day trip with all guys and realize that you need a tampon. There was only so much that I could talk about with my guy friends, especially if (when) it involved GUY DRAMA… #awkwardcollegeproblems. As I got closer to my last preference night ritual, I realized that I was going to have to tell all these potential new members about why I joined my sorority. This was towards the end of my senior year and I had been reflecting on the past four years, including my rough transition from high school to college. Something that one of my home friends said to me that first year seemed to apply to my joining a sorority…I was a fish that was always looking for a bigger pond. Once I got comfortable with being at college, I needed to find a new challenge. That challenge was joining a sorority and thrusting myself into a new group of people that I had never met before….because you know, that hadn’t happened enough my freshman year. So at that last ritual, I told all these girls that I joined to take on something new…and let me tell you, my sorority let me try TONS of new things! I was Mr. RIT Chair and even wound up on the news! Now that I have been out for a few years, I think I joined because I NEEDED sisters. I’m an only child and very recently had to see my mother and her siblings care for their aging mother. They struggled. There’s only one of me. It terrifies me to know that some day I will have to take care of my parents without any help. Not to mention the mere idea of not having parents…at least if you have siblings you have SOMEBODY. I have tons of close friends, but at the end of the day they have their siblings. Heck, even most of my sisters have actual sisters. I know that my sorority sisters will always have my back, but I still always wanted somebody that was just mine…and then I met my big. My big is also an only child. She has cousins that she is close with, but while many people go to older siblings for advice and to talk about important stuff, my big and I have each other. She’s put up with me hating…just about everything and I’ve helped her navigate surviving life after college ends (side note – that would be an AMAZING book title…just saying) and we bounce ideas back and forth constantly. My big and I at her graduation party. Sometimes, we wear our hair the same way. Just like I didn’t (and still don’t) have a set reason for joining a sorority, there are MANY reasons to go Greek. There are still so many negative perceptions out there and I nearly fell for them! I always encourage students to check it out…the worst that is going to happen is you won’t like it. If any of my lovely sisters are reading this, please comment below so I know you’re out there! If you’re a student reading this, check out the Greek Life at your college!! Hamming it up at 15 Year. My unplanned attendance at a Cops and Robbers social.